The large embroidery unit comes with three hoops: 120 SQUARE HOOP (120x120), MASTER HOOP (240X150) and DELUXE HOOP (360X200). Add on the optional embroidery unit and turn your product into an embroidery machine in no time at all. It will take you to an entirely new world – a world full of colour and design, full of imagination and creativity. It's all possible. Sooner or later. Whenever you want. 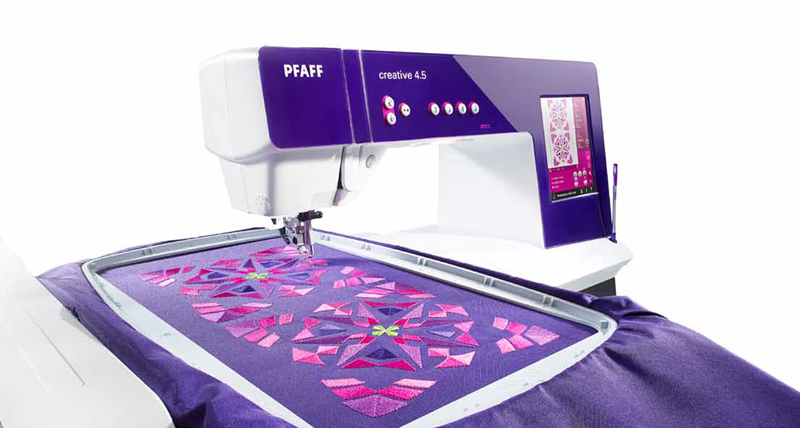 When you purchase the Pfaff Creative 4.5 embroidery unit you can start embroidering immediately with more than 270 exclusive designs included with the machine. The variety of themes and imaginative techniques is constantly being expanded and is just waiting for you. Just a touch on the PFAFF ® creative™ Colour Touch Screen puts you in a world of unlimited possibilities. All the embroidery designs are shown in realistic view in your chosen thread colours. Customize them directly on the screen; the intuitive-graphic interface makes it easy. As if by magic, the machine embroiders the individual design sequences, cuts the jump stitches automatically, and only stops when the thread colour needs to be changed. never been easier or the results more perfect. Just mark the desired positions directly on the screen and the needle begins at exactly the right spot to complete the design.